I had the pleasure of taking a workshop given by Ms. Cast at RWA’s National Conference last summer, and reading this book was like hearing her voice again. I thoroughly enjoyed it. Shannon Parker is a 30-something high school teacher with a passion for flea markets and estate sales. When she goes to a sale out in the middle of nowhere in the part of Oklahoma that she calls home, she finds an ancient ceramic vase with her image painted on it! This vase weaves a spell over her and she has to buy it. Driving home, feeling a little strange, she encounters a freak storm and the pot explodes. When she wakes up, she finds her best friend acting like her slave and discovers that she’s been transported to a mythological world. If that weren’t confusing enough, everyone is calling her Rhiannon and she is also expected to wed a Centaur Shaman, like right now! ClanFintan, the Shaman, is probably one of the greatest heroes I’ve read in romantic fiction in a long time, and yes, the Centaur thing is a little disconcerting (imagine yourself in Shannon’s place), but it does work out without any strange inter-species stuff. PC Cast’s voice is contemporary and fun, like you know this person and really want to hang out or go shopping with her. Shannon/Rhiannon has to deal with a terribly scary enemy and deal with people who believe her to be a nasty, slutty Goddess. She manages it all while remaining a fun, 21st century woman. Being a high school teacher serves her in ways you wouldn’t expect given the situation she finds herself in. Shannon is a girly girl in all the best ways and finds herself surrounded by true girlfriends who help her deal with tough problems along with the enemy who threatens her new found home. I LOVE this book. I found myself actually cringing when things got bad and laughing out loud a lot of the time. This was one of those books you never want to end. Fortunately, there are more in the series and I intend to read them all! 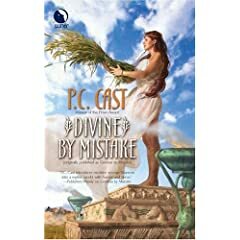 If you’d like to read Divine by Mistake, leave me a message and I’ll pick the name of someone who comments to get this book. Please leave me a working email (separate the elements so as to stop the dumb spammers!). I’ll draw a name next Monday! Words of wisdom from a five year old.